You start the hike in Pomonte and cross the river to the concrete bridge. Then you walk up the old road that once connected the vineyards. You are planted in the middle of a cultural landscape with vineyards and orchards on terraces that were stolen from the mountain hundreds of years ago and later abandoned. Here you will find the traces of an ancient civilization of farmers who have marked the whole mountain. Now all is overgrown with Mediterranean maquis. Follow the signposts nr. 9. After an initial fairly steep grade the road becomes smoother. After crossing the trench Porterogna, you will find the first exit agricultural warehouse. From here you will go quickly through a small forest of chestnut trees and cross a small stream. Now a short climb begins temporarily paved, where it will be interesting to stop and enjoy the view of Pomonte and the sea. In the distance you can see Corsica. Keep on straight without diversion to the Magazzino del Poio and from here, after a short flat stretch, you will reach a creek that passes on the right all the way down to the valley. You will cross him several times. Now you will come to the most beautiful part of the walk from the view of a naturalist. Because here you will find ferns, chestnuts, small waterfalls… There is a shaded area, which is suitable as a hiding place for many animals. You are in the immediate vicinity of the destroyed church of San Biagio, which was closed in the Middle Ages and the whole valley was protected. On top of the hill you will find a crossroads: when you go left it takes you to the path nr. 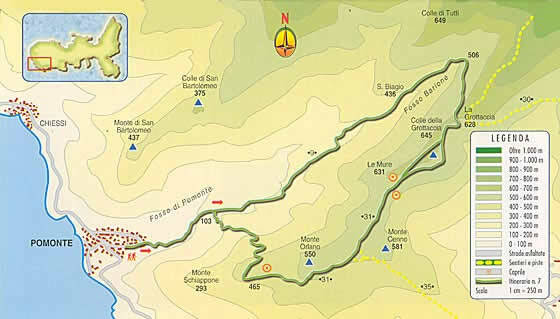 8, can be reached Le Filicaie and the summit of Monte Capanne, the road nr. 30 takes you to Macinelle and then to San Piero. Take the exit on the right path nr. 31 to impinge on the remains of a pastoral village. On the whole Capanne you find this Caprili which are unique. After the Monte Orlando you will descend steep and you are quickly in a garrigue environment with cysts, brooms, rosemary and wild lavender. After passing through a short stretch of granite rocks, keep to the right and the trail will take you back down through the vineyards to the road nr. 9 reach, which takes you back to Pomonte.